GIVEAWAY: Enter to win $50 PayPal for you and one to give to a friend (Ends 7/12/13 at 11:59 PM EST) | A Savings WOW! 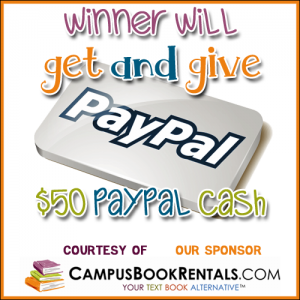 Grand Prize: $50 in PayPal cash for you and $50 in PayPal cash to give to a friend! CampusBookRentals.com rents textbooks to students. They were one of the first ever to offer rentable text books. They started renting textbooks out of Alan Martin’s garage back in 2007. Since then, Campus Book Rentals has rented more than one million textbooks to students on nearly every college campus in the United States. Campus Book Rentals also offers the Rent Back service. Rent Back is an initiative that allows students to rent the textbooks they own – to other students. This can make them 2-4 times MORE money than what they can make with traditional buyback options they might try! Instead of selling back their books at the end of the semester, they can offer them for rent to other students! It’s a win-win situation! Campus Book Rentals also awards scholarships, and is currently contributing a portion of their rental proceeds to Operation Smile. With Campus Book Rentals renting textbooks makes sense, plain and simple! The giveaway will open up on 7/9 12:01 am EST and close on 7/12 at 11:59 pm EST. Just love the Mission Giveaways! Thanks…great prize! This is a great giveaway. I am having my daughter check Campus Book Rental out she needs text books for college. Thanks for the info!